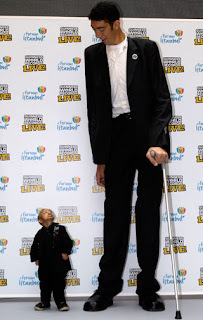 Who saw the news report today "Tallest Man meets Shortest Man"? They are so so tall and so so short and quite amazing. 21, who stands at just 74.61cm"
I was really torn in how I should feel and react to these men. I know they are Guinnes Book Record holders, and I guess that is an acheivement. But part of me felt sorry for them as I felt in the video they were sort of being treated like a circus act. Then I felt a bit guilty feeling that cause they are probably very happy in their lives. Then I started thinking "Would they change their lives if they could". As you can tell I am torn - no matter what thoughts I have I feel guilty having them. Also from the video, I don't think they are very well people. See I am feeling sorry for them again and maybe I shouldn't be. On a total different subject now. Tonight I am of to the movies and a meal with some girlfriends. We are going to see "Thats Complicated" with Meryl Streep, Alec Baldwin and Steve Martin. I'll give you a review tomorrow. Also tomorrow my son Shane is coming down from Cairns for work, but I still get to see him. YAHOO can't wait to see him. I'm looking forward to the movie review Davine, I've had my eye on that movie and hope to get some time to go and see it... I'll wait for the review first though! Awesome that your son is coming down as well! good to hear some good news and you enjoy your visit with Shane. I do the same thing with thoughts....keeps ya thinkin all the time huh? Guilt is a whole 'nother thang. I pick it up like it is beads to put on a necklace. Thanks so very much for you kind thoughts yesterday. I so appreciate your love and warmth. You are such a sweetie. I doubt either man is very well, Davine, as you saw. I think of it this way: They have something that is a disability. I don't feel "sorry" for those with disabilities, as I feel that is insulting to them and their path in life. In this case, while I feel conern, I am glad that they are able to gain some compensation and perhaps some friendships they otherwise would not have been able to gain, had their disabilities not been of the "amazing" sort. That said, I am always sorry when I feel someone's path is cut short. I am reminded of a song my Mother used to sing - "Bless 'em all, bless 'em all, the long and the short and the tall"
I saw that film last weekend, Davine. I am keen to read your review. Some friends of mine have seen it, too. Can't wait for your review! As for the tall and short of it - doubt that either would trade places now, would they? Smell the Roses or Whatever?? Where would I be without my girlfriends?